Meet Jayden, a 4th grade student at St. Peter the Apostle. Jayden is passionate about reading and dreams of becoming a veterinarian. 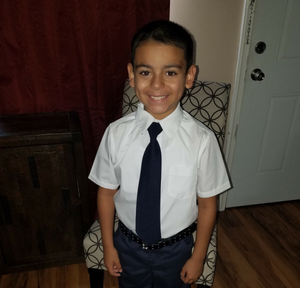 His mother, Melinda knows Jayden is receiving a quality education at St. Peter and she loves how the curriculum includes Spanish, music, and religion. A: I like to read books, sing in the school choir and watch videos on YouTube. A: Social studies because it’s interesting to learn about our past and where we came from. A: My mom. She works hard and tries to do her best to take care of me. A: I want to be a veterinarian. I love animals and would love to take care of them. A: Getting good grades and staying at my school. I am also looking forward to meeting new friends. A: I want him to continue to grow and get the best education possible. I also want him to know he can do whatever he sets his mind to. Q: What makes your child’s school the best for him? A: Jayden is raised Catholic and his school teaches him about Catholicism. I love how St. Peter is teaching him Spanish and music. Q: Why do you think it is important for your child to attend tuition-based school? Are there changes you have noticed? A: I noticed the sense of saftey and security at the school and I know I don’t have to worry about him falling through the cracks. A: I can now give my son the education I always dreamed of! Words cannot express my gratitude! Q:In what way does this scholarship affect your family? A: In every possible way- I am a single mom so it allows me to maintain my household while giving my son a great education. A: I would tell them that it will be the best decision they could possibly make!